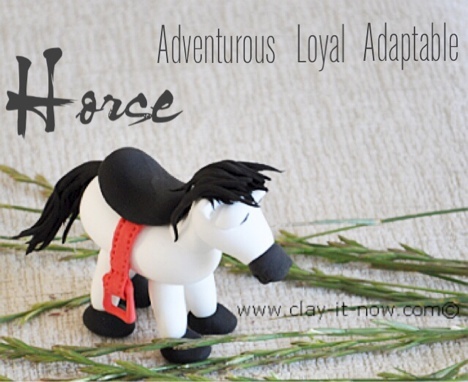 This horse clay was created as part of my 12 animals in Chinese zodiac. Initial idea was to make the 12 animals with salt dough. But some of you wrote to me asking if I could make horse figurine that stand by itself. Choose the clay for this figurine. 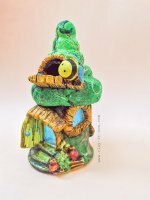 You can use homemade clay or buy an air dry polymer clay that will dry hard. Condition your air dry clay until it's warm and soft and roll it to form the body, neck, head and ears. I used white clay color for the horse but you can change it to other color you like or to whatever clay you have in your drawer. Roll the clay to a ball shape with diameter about 3 centimeter and then change the shape to oval. Pinch the middle part of the oval a little bit and leave it to dry. This would be the body of the horse. Roll another oval shape about 1/3 of the body, tapered one of the end and press the middle part lightly. This would be the head. Roll two small ball shapes, press the side of the ball to form triangle shape and flatten it. These are the ears. Make small cone shape for the neck, insert toothpick and let it dry. Make 4 equal length of pipe or tubular clay shape for the legs. Insert toothpick and let the toothpick protrude about 0.5 - 1 centimeter. These will be inserted to the body later on. Let the four legs dry completely. 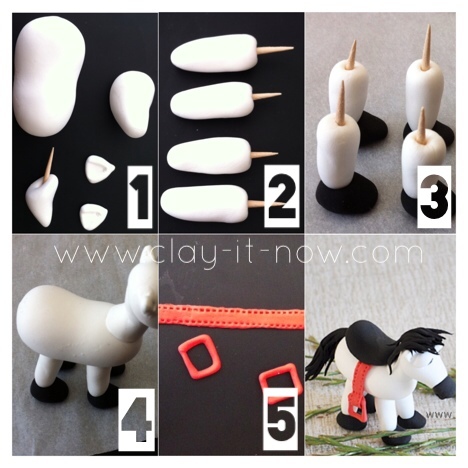 Make the hooves from black clay color. Roll the clay to ball shape, flatten and tapered it. Make 4 of them in the same size. Glue the hoof to the leg one by one and let it dry. After the legs dry, insert the toothpick to the horse body. Adjust the position until you are happy with it and the horse stand on its legs. Insert the neck to the top part of the body. Attach the head and use glue to attach the ears. I forgot to take picture for the next steps. But as shown in the final picture, I rolled the black clay to a cylinder shape for the muzzle and adding 2 black dots for the eyes and white crescent clay shape for the eyebrows. Next, I added the strap from red clay color. Start with making a pipe clay shape, flatten it and hook the end of the strap to a rectangular ring. Place this on top of the body. After this, I added the saddle. Please apologize because I forgot to take the picture of the saddle. But it's not difficult to make the saddle. Roll the black clay to an oval shape, flatten it and curve up the middle up a little bit. Paste the saddle on top of the strap with glue. Finally, add the mane and tail from black clay. I made them by cutting flat clay shape, gathered the end for the tail and paste them randomly for the mane. Your horse clay is ready now.